FIGURE 31 ■ Useful needle configurations for intracorporeal urologic reconstruction. 1. swage, 2. point, and 3. body. (A) 3/8 curve, (B) ski configuration, and (C) "S" shaped needle. FIGURE 33 ■ A Suturescope® from Gomes da Silva. 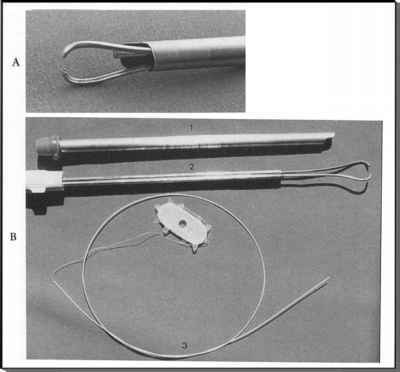 (A) The 8-mm outer sleeve (1), the suturing device (2), and the suture material (3). (B) A close-up of the suturing devices tip. FIGURE34 ■ EndoStitch™ is an automatic, loom-like, 10-mm intracorporeal suturing device. With practice knotting can also be facilitated with this instrument for simple and running sutures. (158,160). Sheath systems that allow the needles and graspers to be positioned simultaneously have been described. Metal clips for replacing intracorporeal knots have been designed and marketed specifically for this purpose (24). Special techniques of tying that produce knots with straight pin-vise-type needle drivers have been reported (43). Mechanical devices are the latest devices that are attempting to reduce the difficulty of intracorporeal suturing and knotting. Stoller has described a simple device that will throw an intracorporeal knot automatically (161). A suturescope has also been invented with a mechanism for aligning tissues and driving a long needle through two opposing tubular structures (Fig. 33) (162). Utilizing this device, an endoscopic ureteroneocystostomy has already been performed. The ultimate mechanical suturing device would be an automatic endoscopic sewing machine. Current work with such a device has been investigated and utilized clinically via a large colonoscope, by Buess and coworkers (163). The Auto Suture Company has introduced its automated, single-handed, 10-mm suturing instrument, EndoStitch for clinical application (Fig. 34). This device utilizes a loom-like mechanism to pass a straight needle back-and-forth through tissues from either end of its jaws. Controllable with a single hand, the needle can simply be reversed and regrasped with a flick of the switch. Intended to be a single-patient use item, the EndoStitch device can be reloaded with the same or different suture materials. Suture materials are available currently in Polysorb (coated, braided, synthetic, polyglactin), Bralon™ (coated, braided nylon), Sofsilk™ (coated, braided silk), and Surgidac™ (coated, braided polyester). The lengths of these preloaded sutures are 18 and 120 cm, with their size being dependent upon the suture material but ranging from 4-0 to 0 (U.S. Pharmacopeia sizing). Other systems for automating anastomoses are coming from advanced work on endoscopic beating-heart surgery. An enormous amount of research in this particular field will undoubtedly lead to many innovative devices to augment intracorporeal suturing (164). 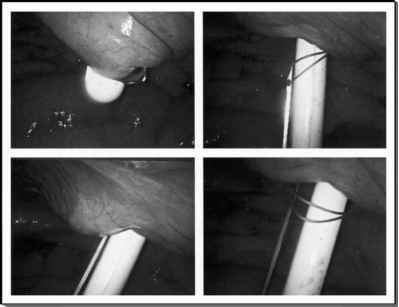 In addition, the ability to complete a complex anastomosis such as aortic-venous or aortic-arterial grafting automatically might have applicability to uroenteric anastomoses. This rather technical approach to intracorporeal suturing just might allow urologists to take advantage of the brightly illuminated, magnified image from the video systems and apply the reconstructive advantages of microsurgery (8,112,163). This of course, mandates bringing the laparoscope in close proximity to the area of interest. Each move of the laparoscopic instrument's tips speeds up in equal magnitude to the degree of magnification (8). All of the intracorporeal skills discussed earlier must be precisely applied or this becomes an impossible task. Hemostasis is even more crucial during laparoscopic microsurgical suturing (160). The ability to observe small movements of the suture material through tissues is fundamental to smoothly facilitate needle driving, suturing, and knotting. Complex urologic anastomoses have been accomplished utilizing microsurgical techniques, including vesicourethral reanastomosis, augmentation cystoplasties, and others (153). The degree of difficulty of microsurgical intracorporeal suturing is twice again as difficult as regular laparoscopic suturing (153). The advantages of microsurgical reconstruction in urology include less need for long-term urinary diversion or drainage, less infiltration with scar tissue, and visually secure suture placement (153). In addition, because of the magnification, special suturing techniques can be performed that make end-to-end anastomoses nearly foolproof (150). Suspension suturing is the technique of converting a square knot into a slipknot and back again on demand (Fig. 35). This can only be accomplished if magnification allows careful suture manipulation. With these techniques, spatial constraints and limited visual fields do not prevent the surgeon from even small anastomoses.